BINOM.DIST function in Excel returns the Binomial Distribution probability of a specified number of successes out of given number of trials. BINOM.DIST function in Excel can be used to calculate Binomial Distribution Probability Mass Function and Binomial Cumulative Distribution Function, we will see both with an example. Binomial Distribution Formula is shown below. number_s – The number of successes that you want to calculate the probability for. trials– The number of independent trials that are to be done. probability_s– The probability of success(for a single trial). TRUE-calculates the cumulative distribution function. FALSE-calculates the probability mass function. In the above example success is defined as number of heads on toss of a coin. In the above example Binomial Distribution Function – BINOM.DIST takes up the number of success which ranges from 10 to 90, number of trials which is 100, probability of success in each trial which is 0.5, and cumulative as FALSE, so that probability mass function is returned. 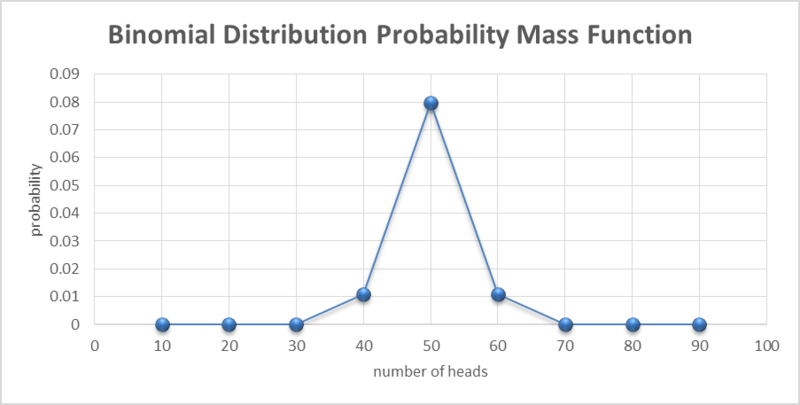 When we plot the result with number of success on x axis we will get the graph for probability mass function which is shown below. 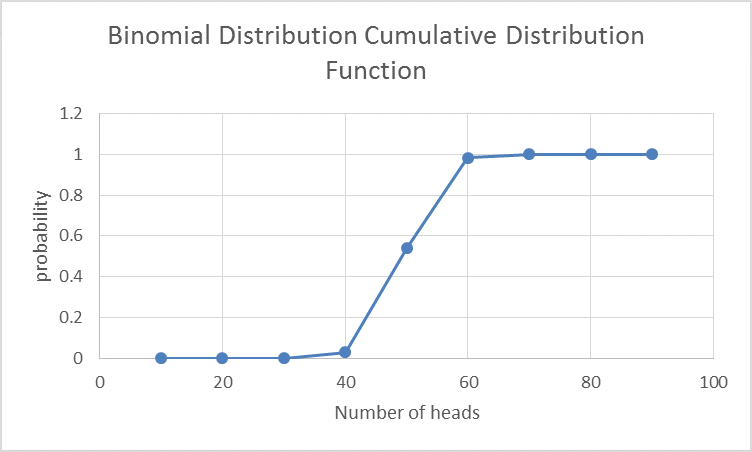 In the above example Binomial Distribution Function – BINOM.DIST takes up the number of success which ranges from 10 to 90, number of trials which is 100, probability of success in each trial which is 0.5, and cumulative as TRUE, so that cumulative distribution function is returned.